The third event in The Architects Series, the new cultural format at SpazioFMGperl'Architettura, features Winka Dubbeldam, architect and director of Archi-Tectonics, whose recent projects include the Inscape meditation spaces. Winka Dubbeldam, architect and director of Archi-Tectonics of New York and Amsterdam, will be the featured guest at the third event in The Architects Series, a new cultural format The Plan magazine presents at SpazioFMGperl'Architettura, the exhibition gallery and showroom run by Iris Ceramica Group brands Iris Ceramica and FMG Fabbrica Marmi e Graniti. The new event, entitled The Architects Series - A documentary on: Archi-Tectonics, takes visitors to SpazioFMG behind the scenes in the New York studio to find out how the architects work and focuses on “New Solids”, an important theme for founder Winka Dubbeldam which will be the topic of the conversation following the screening. Winka Dubbeldam uses the term “New Solids” to refer her “interest in those massive, soft, luxurious forms that can offer comfort while anchoring us securely to the ground. The result is an architecture recalling industrial design, the fruit of quality engineering guided by constant research into new materials and production methods and by a great sensitivity to issues of environmental sustainability”. The intention of bringing change to architecture through “digital craft and poetic precision”, Winka Dubbeldam’s declared mission, is perfectly visible in a prototype project the studio created in Manhattan for the Inscape Centre and its meditation spaces. Archi-Tectonics designed Inscape’s meditation spaces in Manhattan’s Chelsea district, a space measuring more than 500 sqm on the ground floor of a building on West 21st street. 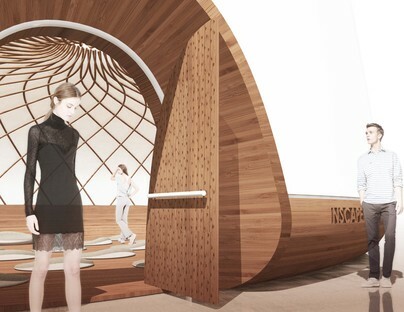 The project specifically included design of the "Dome Rooms" and "Alcove Rooms" for meditation, defining and fine-tuning prototypes for other Inscape centres that might be built elsewhere in the world. On the basis of the consideration that meditation requires preparation for a different mental state, the interior design is set up as a pathway, a gradual transition for people coming in off the fast-paced streets of Manhattan and needing to prepare themselves for meditation. Visitors entering the Inscape centre come into a big lounge characterised by soft lights and sounds, filtered air for aromatherapy, natural materials such as linen chairs and big lights on the ceiling: an immersive environment that induces a state of inner peace preparatory to taking the next step. 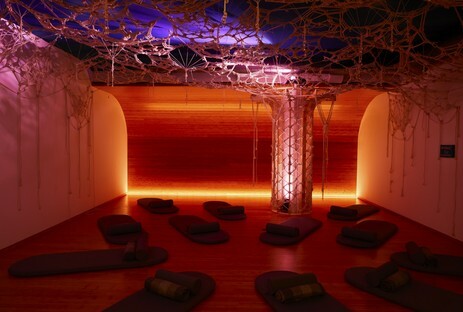 The meditation rooms are designed to be all-encompassing spaces. Designed through an accurate digital process of 3D design and prototyping, with in-depth testing of the materials used, the Bamboo Dome is an independent structure; a “holistic” enclosure, welcoming users and made of bamboo, as the name suggests. The floor, the base structure forming the bench in the dome and the dome itself are all made of bamboo. The dome has an unusual self-supporting structure consisting of interwoven bamboo, and is lit up with a ring of LED lights that permit the intensity and colour of the light to be adjusted to suit the meditation, which is, like all high-tech elements, hidden from users’ view. The space has no sharp corners and no furnishings other than chairs designed by Ligne Roset specifically to support the body in positions appropriate for concentration and meditation.